It’s that time of year, Spring. “April showers bring May flowers” AND FLOODED BASEMENTS. Rain is good. That’s a fact. precipitation has a dramatic effect on agriculture. All plants need at least some water to survive. Plus, rain makes our lawns green right? Who doesn’t want a green lawn? But, heavy precipitation can be devastating to homeowners especially those who live in or near flood plains. Lets face it, unexpected water in your basement is not a good thing. Water can damage walls and floors, destroy carpeting and padding, ruin furniture and personal belongings, and can lead to growth of bacteria and mold. Water damage in your basement can really cause some major damage to those irreplaceable items like photo albums, antiques, and family heirlooms. Keep this in mind…the majority of homes will end up having water in the basement at some point during the life of the home. It’s not a questions of if it will happen, but its a question of when it will happen. So…what do you do if you have water in your basement? Well, I’m glad you asked. I’ve compiled a list of 7 things you should do if you find water in your basement. 1. Protect Yourself. You’re probably not sure what’s in the water or where it came from yet. Keep in mind the potential hazards like if the water is sanitary (it could contain E. Coli, or other harmful bacteria). Or what if the water just came out of the hot water heater and is still boiling hot? Protect yourself by wearing gloves and waterproof boots. Better safe than sorry. 2. Shut off the electricity to the basement. It doesn’t matter how much water you have. Water and electricity don’t play well together. Water conducts electricity making it extremely dangerous and deadly. You do not want to be shocked by this reality. 3. Investigate the cause. You will need to find the cause of the water in the basement. If the flood is the result of a broken pipe, turn off the water at the shut-off valve. If the water in the basement is from a clogged drain, try to unblock or unclog the drain. 4. Air it out! You may want to open any available windows or doors to let the fresh air in. What if the water was from a sewage backup? Yea…open a window. Yuck. 5. Get it out! 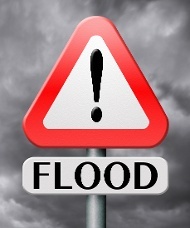 Do your best to remove any of the standing water from the basement or the effected areas. Shop vacs work the best if you decide to handle this task yourself. BUT, I will caution you…this can take a long time. Hiring a professional to remove the water in the basement may be your best bet. Professionals can be found in the yellow pages under “water damage” or “flood damage”. If you have a water damage in Rockford, Dekalb, Naperville or any surrounding communities you can call Clean USA 877-754-1226. 6. Throw it out! When in doubt, throw it out. If you have any wet or damaged furniture, carpeting, or belongings you may want to consider throwing them out. Especially if you have decided to do the work yourself. A professional will have the tools, drying equipment, and expertise to dryout and save most if not all of your valuables. 7. Most importantly, disinfect every area. Every single area that has been touched by the water needs to be thoroughly cleaned and disinfected. This is probably the most time consuming and difficult part, BUT IT’S THE MOST IMPORTANT! You will want to start by scrubbing each area (split areas up into small sections) using hot water and a heavy duty cleaner. You don’t want to take any chances of bacteria or mold growth.